today has appeared the gigayacht Black Pearl (built 2017) with a length of 106,8m, which is larger than the Maltese Falcon (HY-154). Both ships are equipped with Dynarig sailing system. The sail surface area of the Black Pearl is 2900 qm. Furthermore appears the Atlantic Osprey (SIETAS TYP 136), ex. Alster Rapid (see HY-191), ex. Arneb (see HY-191A), which is a ro-ro-nuclear freighter, built 1986 at SIETAS/Neuenfelde. Z = 2002 after modification, still with rescue boats. The Mercandia VIII (Z=2015) had been modernized and operates the routes Helsingör - Helsingborg, Rödby - Puttgarden, temporarily also Gedser - Rostock. 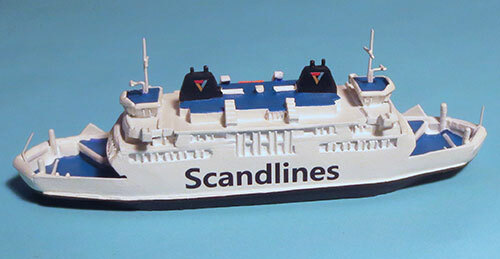 To the former ferries of the route Helsingör - Helsingborg also belong the two Scandlines ferries Prinsesse Anne-Marie and Prinsesse Elisabeth. Later - after the sale 1997 - they operated the route Cuxhaven - Brunsbüttel as Jochen Steffen (see HY-188) und Hinrich Wilhelm Kopf. 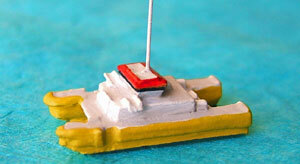 The toll patrol Helgoland (see also HY-117) has got a new painting and is now available in blue. The Öresund ferries Tycho Brahe and Aurora af Helsingborg run in a different colouring from today. Due to several inquiries I now offer them in a limited edition. 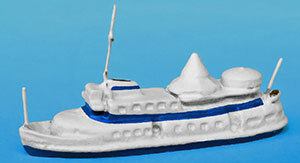 Also the Africa Mercy is now available in a further design: the current colours. The former IC ferry "Dronning Ingrid" (see HY-6C). had been transformed into a floating clinic. 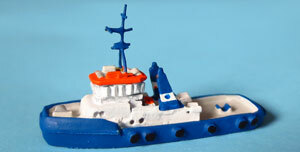 The alterations took place 1999-2007 at the A+P ship yard. 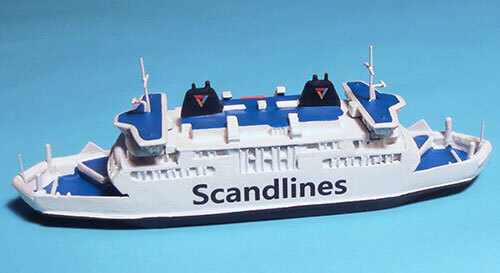 Today appear the Scandlines ferries Tycho Brahe and Aurora af Helsingborg. Built as railway and car ferries they serve the route Helsingör - Helsingborg since 1992. The bridges of these both danish-swedish sisters are very different. Also compared to the previous ferries (until 1991) there are huge deviations: for example the ship's width had been more than doubled from 13,3 m to 28,2 m. For that reason the ships appear a little bit bulky, but otherwise they allow an extremly fast loading and unloading in 10 minutes. Some time ago I got very good pictures of the both ro-ro-vessels of sietas type 52 Hansa and Wasa operating as CARGO FERRIES for the well known TT-Linie. 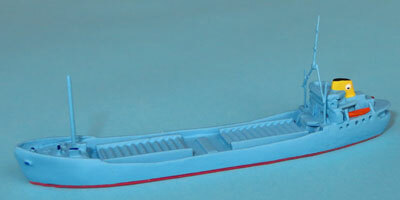 They were the first cargo ferries of this ship owner company and had been equipped with bow- and stern loading ramps. The small river boat Mainz operates for the WSA Bingen. The special edition HY-194A shows the transfer of deceased chancellor Dr. Helmut Kohl on 2017-07-01 to the sepulchre in Speyer. The vessel has a half-mast-flag and the coffin is loaded in stern. Today appear two more ships of the Sietas shipyard in Hamburg. 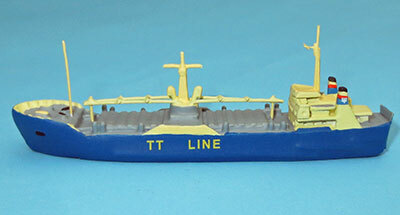 With Type 52 the first ro-ro-freighters were built: The Hansa only with bow flap and the Wasa already with opportunity for bow and stern loading. Under the first operator TEAMLINE they served the route Hamburg - Stockholm. Subsequent operators (z.B. 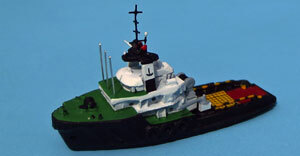 SEA MALTA) deployed them worldwide and also only with ramps for stern loading. 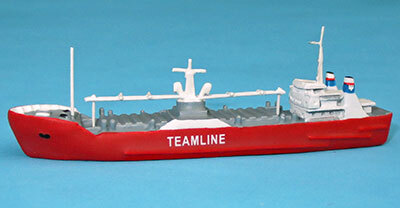 These ships were built highly durable, so that they are in service even today after 50 years! Today appeare two danish ferries of the Vogelfluglinie "Prinsesse Benedikte" and "Prins Richard". Prinsesse Benedikte in state of 2004 after modifications in the upper decks and fitting additional hanging decks. Prins Richard in state of 2014 after conversion to hybrid ferry with green hull line and new lettering (Scandlines Hybrid Ferry). 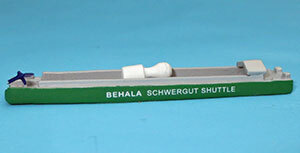 The BEHALA heavy goods shuttle has been developed especially for Siemens in Berlin-Moabit. The biggest gas turbine in the world, the SGT5-8000H weighs 440 tons. The shuttle takes also all the other gas turbins to Berlin's Westhafen. The project is now to be extended to other transport functions. Z = with gas turbine (packed). Today appear two ships of the Washbay Line: Alster Rapid, built at Sietas (Sietas type 136), and Henry Stahl, built at Schulte Bruns. 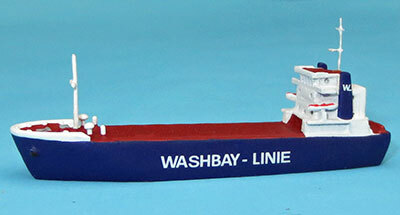 Until 1995 the Washbay Line served the route Hamburg - King's Lynn carrying cars and bulky goods. For each of both ships also appears a follower version. 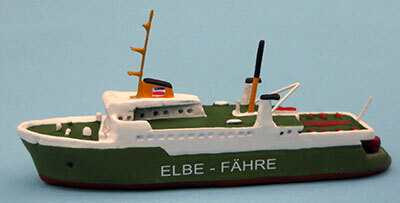 The elbe ferries Schleswig-Holstein and Niedersachsen are both re-issued. 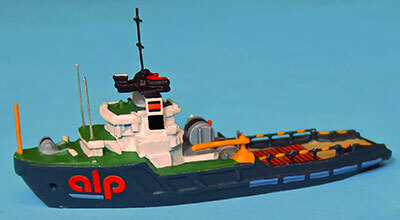 After the elbe service further use brought interesting changes: several modifications of stern and superstructures, different colors, fonts and onboard cranes. The new models of today show these various changes. 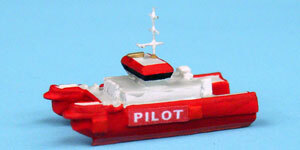 In addition to the former issued pilot vessels Elbe Pilot (HY-100A) und Weser Pilot (HY-100) are now available two versions with heli also. BRZ 270 |13 kn | bollard pull 70 t.
In addition to Grete und Anne Marie (see 2016-02-29) apppear today the estonian versions. 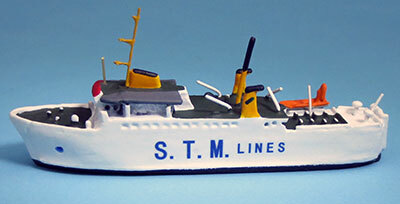 Note the grey passenger decks and the different lettering. power: 2 Wärtsilä, total 5320 KW | 15 kn. car fery Virtsu - Kuivastu. car ferry Rohukula - Hiiumaa. 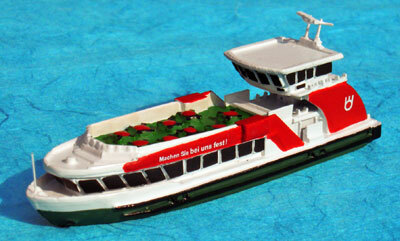 A new ferry service is established between Cuxhaven and Brunsbüttel. The shipping company Elb-Link (Cuxhaven), a subsidiary of Saaremaa, operates there two sister vessels since 2015: the double-ended ferries Grete and Anne-Marie (previously operating between Virtsu und Kuivarstu/Estonia). 1969 - 1981 the Niedersachsen (see HY-11) and the Schleswig-Holstein sailed between Cuxhaven and Brunsbüttel, both operated by Schiffahrts GmbH Grüne Küstenstraße. After a break of 18 years a new trial had been started 1999 - 2001 by the shipping company Elbe-Ferry (Harms) with former danish ships. One of them was the Jochen Steffen. 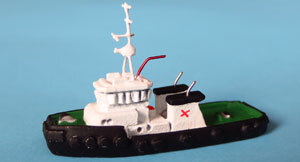 We have also News concerning pilot station vessels. 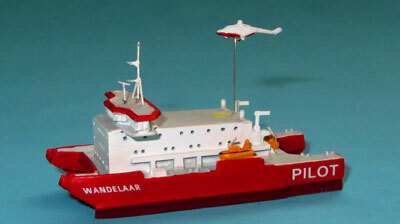 Since 2012 the Belgian DAB Vloot operates the SWATH pilot station vessel Wandelaar with tenders. The working version shows a Sikorsky-helicopter during winching. max. 50 pilots | crew: 20 Pers. 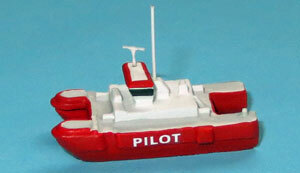 The Westdiep had been delivered to the Belgian piloting service as the first SWATH pilot tender. The LNG-energy barge Hummel supplies cruise liners with electricity during their stay at port. The operator is "Hybrid Port Energy" and cooperates closely with AIDA Cruises. Nowadays also ferries are sailing with LNG power, for example the new Helgoland ferry "Helgoland" and the redesigned and modernized AG-Ems carferry Ostfriesland. 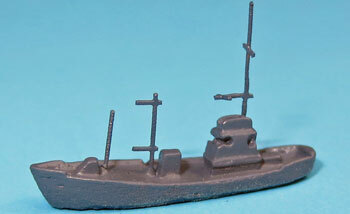 Through the modification the Ostfriesland has been converted into an almost new ship. A book about this Borkum-ferry is available at Oceanum Verlag. Under the factory numbers 1295 and 1296 the latest big ferries have been produced by Sietas for the danish Faergen company. The "Samsö" had only some test runs in 2011 before she was converted 2012 to serve now the route Spodsbjerg - Taars under the new name "Lolland". 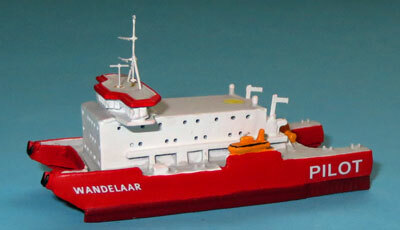 The sistership "Langeland" followed some month later. ship owner: Faergen; ship yard: Sietas, l=99,9m; w=18,2m; d=3,2m; 600 passengers, 127 cars; BRZ=4500; TDW=750; power: 4 x 850 KW Diesel; 16 kn. 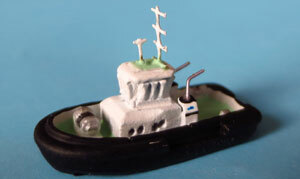 car ferry (only test runs). car ferry, route Spodsbjerg - Taars. ship yard: Mützelfeld/Cuxhaven | operator: Alp Maritim Services BV. Also a new yacht has appeard: "Impulsive". 1994, Monaco, Z=2011, flag: Saint Vincent and the Grenadines, luxury yacht. HY-181 "Impulsive" The luyury yacht "Impulsive" is often seen in Monaco. 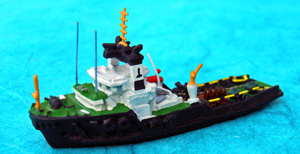 The design is similar to the "Moonraker" (HY-94). It is provided with pool and radom. 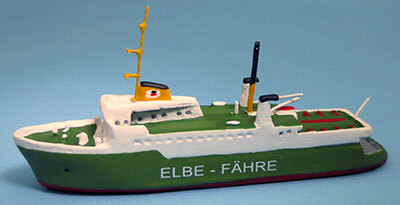 Last but not least: a harbour ferry of Hamburg: "Tonne". 1960 Germany, Z=2015, ex Tonndorf (-2008), harbour ferry. This is the good old "Tonndorf" (see also HY-KÜ-29	and HY-KÜ-30), built at SIETAS. 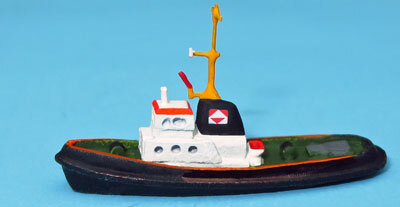 Furthermore new are four Alp anchor handling tugs. 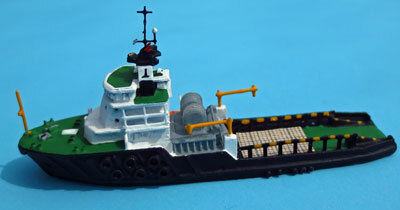 The Harms tugs ( HY-79 "Janus", HY-80 "Ursus", HY-136/ HY-136A "Uranus", HY-139/ HY-139A "Orcus") had been sold to Alp Maritim Services BV. The A-Frames had been removed, also the big hydraulic engine on backbord. The hulls are now grey colored with orange emblem. The winches of "Alp Winger" and "Alp Forward" are now expanded. Today we offer five new models on the subject "Airbus". (Already available from HYDRA: HY-73/HY-73A "Afon Dyfrdwy", HY-74A "Breuil", HY-74B "Brion", HY-75/HY-75A/HY-75B "Kugelbake", HY-89B "SCH 2635" Push tow with Airbus equipment). 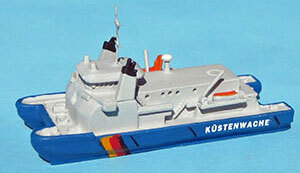 First the ro-ro-transportship "City of Hamburg" in a basic version (HY-174) and in working state (HY-174A). The ship is also used for car transport. 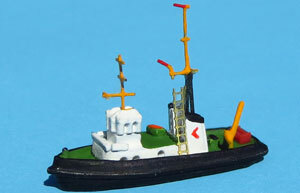 Furthermore HY-175 the sister ship "Ciudad de Cadiz". And last but not least HY-176: a new edition of the "Ville de Bordeaux" Z=2014, supplemented with HY-176A in working state. The old version (HY-71) is no longer available. tailgate open for unloading a cockpit segment of A 380.
in addition to the Grönland (HY-170) and Nungu Ittuk (HY-171) today appeares the third and last version of that heavy-lift cargo vessel and icebreaker (class 1A super): the Kista Arctica (HY-173) of Royal Arctic Line. 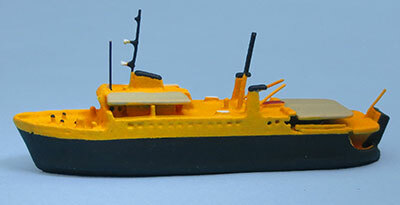 from now the icebreaker and heavy-lift cargo vessel "Grönland" is available as HYDRA model, and also its variant "Nungu Ittuk" after modification 1983.
new helipad at the stern. Also new is "Hunte", a harbour tug in Hamburg, operated by Lütjens & Reimers since a long time (before: URAG/Bremen, see also HY-125 "Hunte"). owner: Port of Fujairak, U.A.E. l=33,1 m; w=12 m; d=6,1 m; 2 Woitsila à 3217 PS. 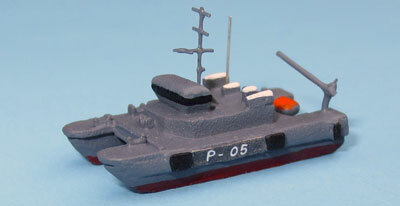 I'm pleased to announce you today some variations of the recently produced HY-169 "Kehdingen" (type Sietas 43). 1967, Norway, Z= 1987, type Sietas 43, BRT 1342.
shipowner: R. Jakobsen, Bodö (Norway). 1967, flag Malta, Z=2002, type Sietas 43, now BRZ = 1437. 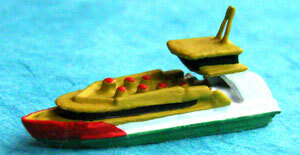 Santor ANS Shipowners Ltd, operator: Rana Ship Managers A.S.
1967, Turkey, flag Panama, Z=2009, type Sietas 43. Altrans Maritim Services AS / shipowner Altintas Shipping Bandirma / Turkey. 1980 USA, Z=2013; l=53,6m, w=11,3m, d=3,8m. training ship of United States Merchant Marine Academy. 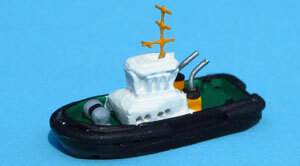 The NASA ownes a fleet of special vessels: barges and salvage tugs. For the Space-Shuttle program for instance the huge external tank ET had to be transported and the shuttle boosters had to be salvaged. in working position with equipment, booster, etc. in towing position; for NASA Barge "Pegasus" (HY-167). 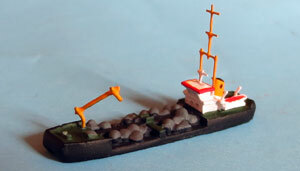 for towing unit with salvage tug "Liberty Star" (HY-166B). I'm glad to announce some new models today. loading capacity: 960 passengers, 90 cars, 60 trucks, 152 TEU. Sunk 16.4.2014, more than 300 people have died from this tragic accident. 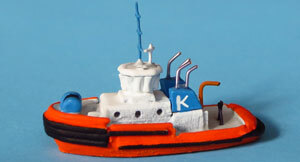 Furthermore five models concerning the two harbour tugs "Adrett" und "Accurat", identical in construction, 1968 (shipping company: Lütgens + Reimers/Hamburg). Both are still in service, even though under different names (see below). ex. Accurat, shipping company Wulf/Cuxhaven. ex. Adrett, shipping company J. Johannsen & Sohn/Lübeck, stationed in Travemünde. ex. 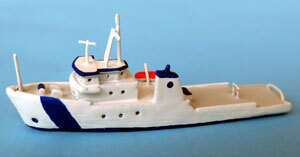 Clara, ex Adrett, shipping company Sleepdienst Bijma B.V./Niederlande. ASD-tug, is a very new tug in Hamburg harbour of the operator Lütjens & Reimers, type Damen 2411, bollard pull 71 to. 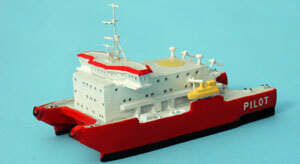 2007 Germany, is a especially develloped Futura Carrier for ore (length 97,5m, width 13,6m, depth 3m). model state: unloaded. Operator is the Schramm Group/Brunsbüttel. The ship is used for ore transportation (together with "Kaja Josephine") for Aurubis/Hamburg from Brunsbüttel to Hamburg. Cargo capacity until 2740 to. More than 1 million tons per year have to be shipped. 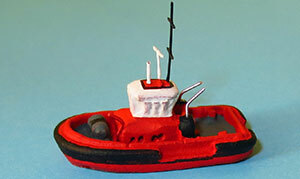 The Sophia has been develloped especially for shallow water, tidal current, low bridges and narrow waterways. The logo of Aurubis is located on the side. sister vessel of "Sophia-Soraya". 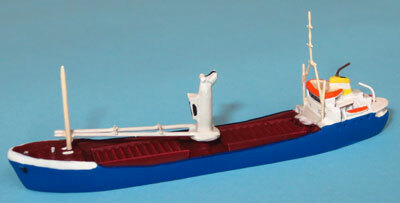 Especially develloped Futura Carrier for Aurubis (Hamburg). Model state: heavy loaded. Available soon. 1972 Germany (ex. Lichterfelde), Z=after modification, for tranport of sulfur acid (Aurubis). Shipyard is the SIETAS-Werft. 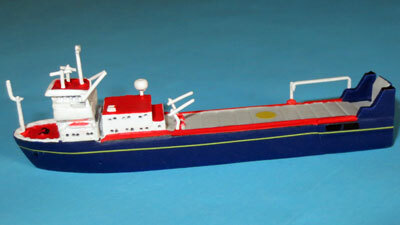 Modified 2003 from Hitzler Werft as double-hull tanker. More than 1 million tons of sulfur acid has to be shipped per year. The acid is produced continually from Aurubis (Hamburg) during copper smelting. 1975 Germany, Z=operator Imperial Shipping Group with 6 Euro-II-lighters. size of pusher train: length=190m, width=34,2m. 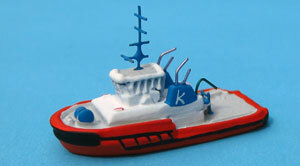 HY-156 "Rüstersiel" 1988, traffic control ship, operating for WSA Wilhelmshaven. HY-157 "Triton" 1997, buoy laying vessel with fire fighting system and big navigation bridge; operating for WSA Tönning. 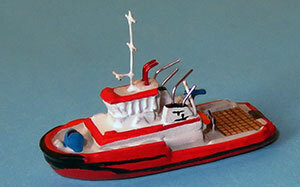 "Franzius Plate" 1987, work vessel and dredger; operating for WSA Bremerhaven. HY-159 "Prof. Albrecht Penck" 1951, oldest german research vessel until 2010; operator is Baltic Marine Services. 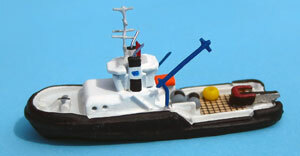 "Salvador Dali" 2005, Spain, asymmetric tractor tugs (ATTs); both are very innovative vessels with wide hull. The mega yacht Maltese Falcon. Equipped with Dyna-Rigg sails and the sail area of 2400 square meters (Gorch Fock: 2000). 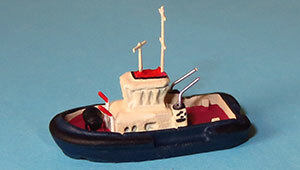 A speciality for all yacht enthusiasts. 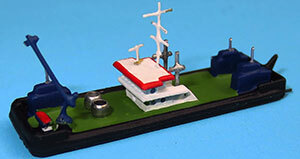 under the motto "your ship with the musical" following models in scale 1:400 are now available. These very known Hamburg harbor ferries advertise for the musicals "Lion King", "Tarzan" und "Phantom of the Opera". 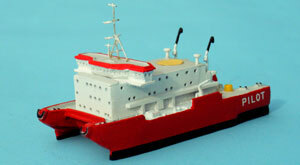 - the Norwegian tug "Vivax" is owned by Reederei Ostensjo and is identical in construction to "Bugsier 9" (see HY-135). 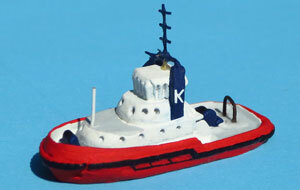 - the New Zealand ASD-tug "Tapuhi" is identical in construction to "Peter" (see HY-118) and another sister vessel "Taiki". The operator is Centre Port's Wellington. HY-KÜ-31A "Halunder Jet"	 The Halunder Jet is now available in a revised version and replaces HY-KÜ-31. 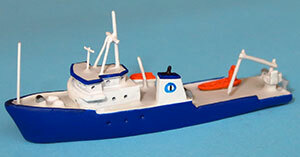 In addition to the presidential yacht Williamsburg (HY-146) today is released the yacht Honey Fitz of J.F.Kennedy. 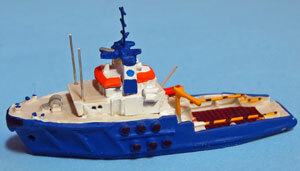 HY-147 "Honey Fitz" presidential yacht: Kennedy / Johnson. 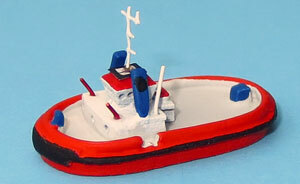 Some new work boats are now available and demonstrate some special functions of the WSA (Water and Shipping Authority). 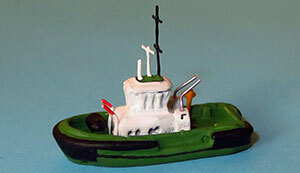 HY-148 "Mittelgrund" work boat: dredger. 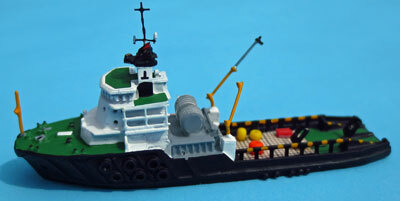 HY-149 "Granit" work boat: stone carrier. 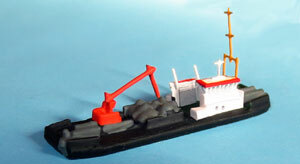 HY-149A "Granit" work boat: stone carrier (loaded). 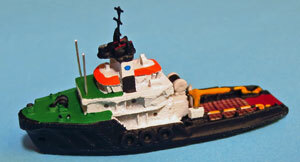 HY-150 "Vilm" work boat: oil pollution fighter. HY-145 "Venus" - the megayacht "Venus" of Steve Jobs (Apple), which had been designed according to his ideas; completed however after his death. HY-146 "Williamsburg" - presidential yacht "Williamsburg" AGC369 of USA presidents Truman and Eisenhower 1945-1953. Ex. 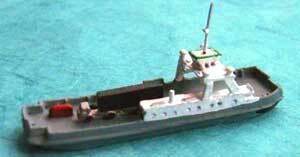 "Aras" (1930-41) und gunboat PG56 (1941-45). Already during construction it had been rebuilt with an A-frame and lateral sponsons. 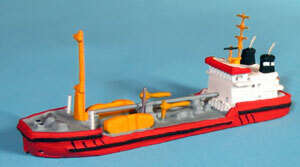 Uranus - the biggest german anchor handling tug - is now also available in the HY-series. 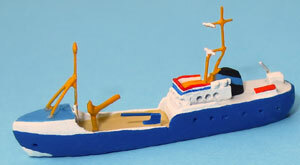 In HY-136A as offshore (anchor handling) version. 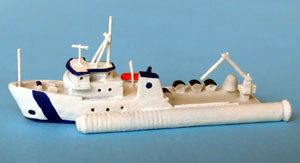 Elbe and Ems are interesting multi-purpose tugs of the same type: two assistance and anchor handling tugs. 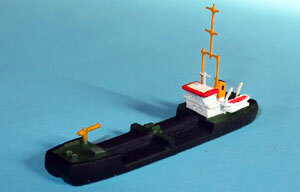 One more tug from Bugsier (Hamburg) is now available. Size and construction is definitely differing to "Bugsier 5". 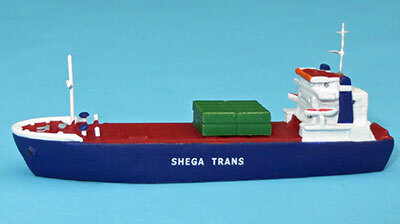 Tug for shipowning company Bugsier. Getting an age of 100 years it went through many modifications. Z=1980 with mast moved aback. Built in Moscow just as the sistership "Ribnitz-Damgarten". They were the last new buildings for the "VEB Weiße Flotte". 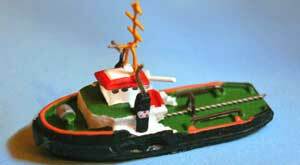 Some time later than ocean tug Mega today has appeared the barge Motti. Deep loaded with coal. 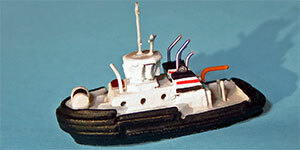 The new four tugs are all harbour assisting tugs and are very different in construction (hull and tug technology). HY-118 "Peter" tug assisting in Hamburg harbour for Petersen & Alpers shipping company. HY-119 "Axel" tug assisting in Travemünde for J. Johannsen shipping company. HY-120 "Bützfleth" fire fighting tug assisting in Brunsbüttel for "Elbclearing Betriebsgesellschaft"; presentation in fire fighting state. HY-121 "RT-Magic" tug assisting in Bremerhaven for Kotag shipping company. HY-116 "G 92" Furthermore the DDR patrol (SAS-boat) "G 92" is now released; see also the intelligence collector "Hydrograph" (HY-111). HY-100 "Weser Pilot" The pilot vessel "Weser Pilot", constructed 2010, is the sister ship of the new "Elbe Pilot". 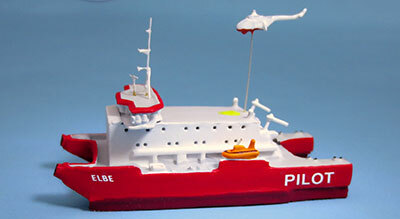 Both new ships are larger and more powerful than the former "Elbe" (now "Hanse Pilot") from 2000. 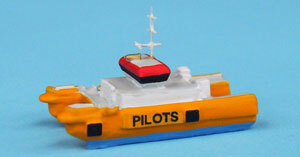 HY-100A "Elbe Pilot" The new pilot vessel "Elbe Pilot" is available in working state: crane extended and boats removed. HY-101 "Natalia Bekker" The SWATH wind park tender "Natalia Bekker" is used for service and transport in the offshore wind park "Bard Offshore I". 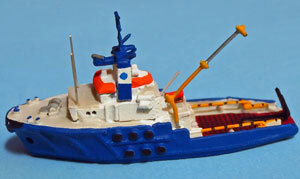 The pusher boat "Ronja" - former "SCH 2613" - is now colored yellow and blue; it is operated by the "Märkischer Bunkerservice". 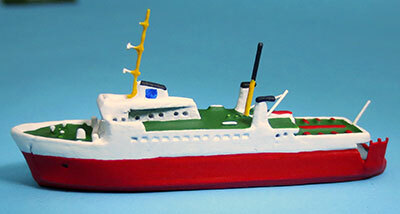 For the ART series is now added "Weserlust" - the last passenger paddle steamer of the so called "Fischgeschwader" (see also "Delphin", "Hecht", "Lachs", "Forelle"). 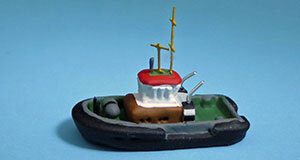 The railway and passenger ferry "Twickenham Ferry" is now available with an own order number. 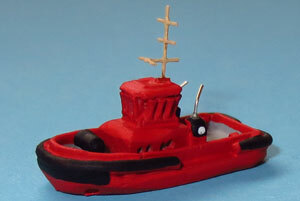 The new models from today are ships with special skills. HY-57A "Baltijsk" The Baltiysk is the former ro-ro-ferry Finnrider (ex Railship II) - now sailing for Management Baltic Reefers/St. Petersburg. Also the Finnrider will be available soon again! HY-113A "Linda Dan" The Linda Dan (operator J. Lauritzen) is a danish freighter for heavy cargo and also an icebreaker. 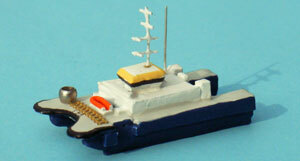 Available unloaded (HY-113) or with cargo (HY-113A). 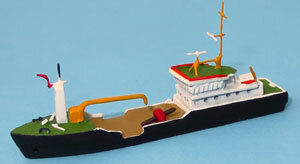 HY-111 "Hydrograph" The Hydrograph is a special inteligence collector ship of the former GDR. 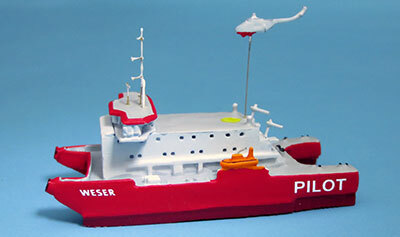 HY-110 "Seelotse" Seelotse is a wellknown traditional german pilot ship from the 50th. Today sailing as traditional museum ship (Bremen). Borkum (Germany) and Perseus (Netherlands) are modern SWATH pilot tenders. 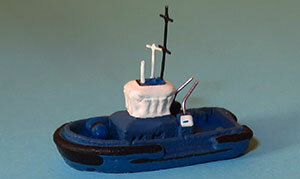 Just in time to the international meeting in Kassel I can offer you some new models. These are working boats of the German authorities (Cuxhaven, Bremerhaven, Emden, Wilhelmshaven). Some vessels you can see in offshore operation. 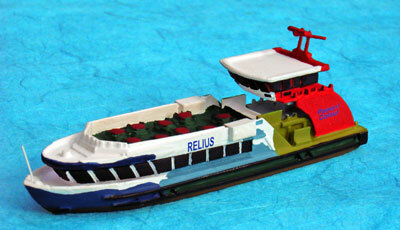 For friends of the ferry scene the Rassow-Libben ferry (white fleet) might be interesting. 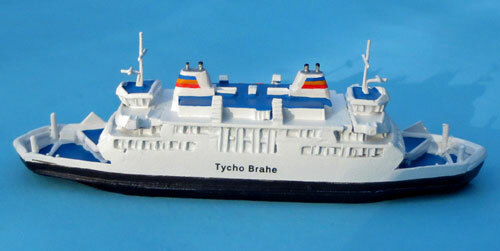 During 1974 - 1994 she connected Hiddensee with Rügen (capacity: 54 passengers, 6 cars). Three ships with ecologic usage. At first the research vessel Beaufort, which completed several test runs with different towing kites (SkySails GmbH). HY-102 "Leyhörn" The Leyhörn was designed for operation in the coastal waters of the North Sea. A modern oil-recovery system can recover 80 m³ of oil per hour. Special gas and explosion protection permit operation in dangerous environments. HY-103 "Steubenhöft" The multi purpose vessel Steubenhöft had been designed as water injection ship. Das Kümo Greundiek, is a museum ship and is operated by "Alter Hafen Stade e.V.". It is very well known in Northern Germany. The pusher boat Alfred Uhr belongs to the 27th type series of "Yachtwerft Berlin". It is operated by "Deutsche Binnenreederei". 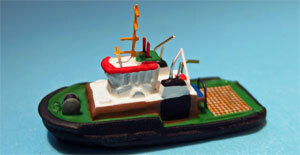 Here shown with four coal barges. HY-106 "SCH 2706 Alfred Uhr"
A further specialized ship is the buoy tender Buk (WSV Stralsund). 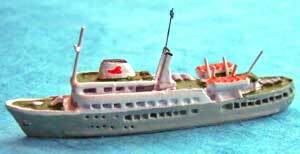 After taking over 1992 by the shipping company Brise it was used also for research projects. New name: Beaufort. It is internationally known from tests of Skysails company. 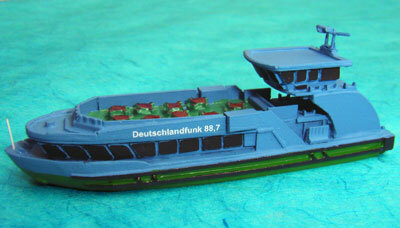 For friends of inland navigation the pusher boat SCH 2635 of type Elbe is now available. It is multi-purpose used. For colectors of ferries the "Hein Godenwind" in a new version as Skagen Express (Stena Line) may be interesting. Beside the anchor handling tugs from the Harms company the HY-Series now also contains the new Baltic Sea tugs Kiel and Claus. 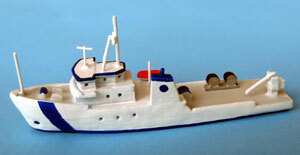 They are the most powerfull tugs in the Baltic Sea. Home ports are Kiel respectively Travemünde. 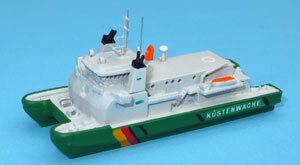 The catamaran Hansestar HY-KÜ-15 has appeared in a revised edition. HY-KÜ-15A shows the catamaran 2008 after sale to the Netherlands as Willem Barentsz. Elbe-City-Jet, totally coloured in white. served the route Harlingen - Terschelling. 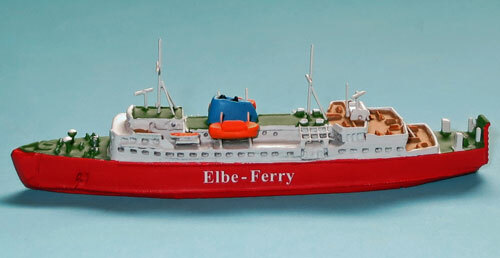 Collectors of the HADAG-Fleet might be interested in the ferry Bürgermeister Mönckeberg, which had been used for Elbe trips. Yacht design is connected with luxury, elegance, extreme innovation, futuristic ship architecture and creativity of wellknown yachtdesigners. So yachts are often designed with soft, expressive and very racy shapes. In the HY-series are now launched following five modern and shapely yachts. "Nero" A modern hightech-yacht in Vintage style. The owner is Neil Taylor. "Moonraker" The fastest yacht of the world; owner is car- and yacht producer John Staluppi. 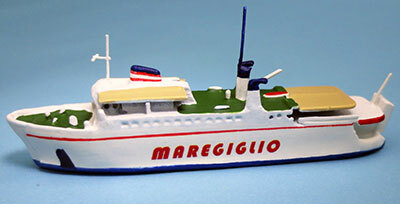 "Destriero" Megayacht. Former owner was prince Karim Aga Khan. 1992 fastest atlantic crossing. HY-96 "Lady Ann Magee" An english superyacht and charteryacht. Owner is the british irish businessman Michael Smurfit. "Arethusa" Superyacht. Owner is Indy Yachts. HY-92 "Kalizma" In the HYDRA series is now launched the historical luxury yacht Kalizma (1906; Z=1967) of Elizabeth Taylor and Richard Burton. The ship is still used as private yacht and owned now by an indian billionaire. HY-10A "Glückstadt" The car ferry Glückstadt had been modified end of the 90th. 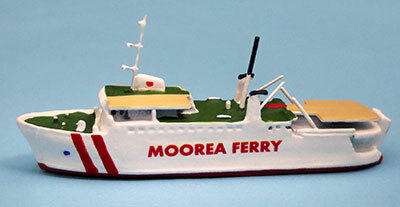 The model shows the ferry with the new bridge. 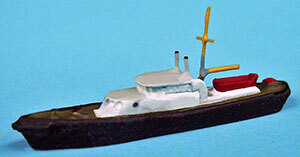 In the ART series has now been added four passenger paddle steamers owned by the "Norddeutscher Lloyd", the so called "Fischgeschwaders". 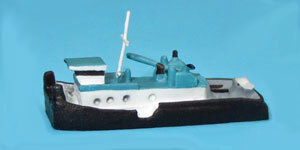 These very popular paddlers were used for coastal service at Bremerhaven. Oortkaten, passenger ferry at Hamburg Harbour (type 2000). Advertising international horticultural show 2013 in Wilhelmsburg. Tollerort, passenger ferry at Hamburg Harbour (type 2000). 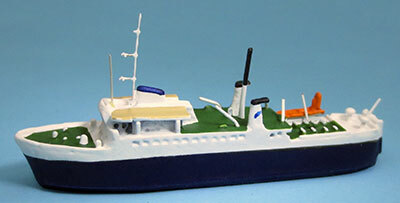 Passenger ship Nordwelle, ex. 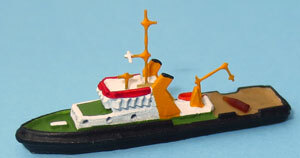 Gorch Fock (see HY-KÜ-41). 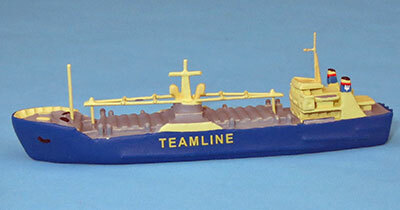 With blind funnel operating under shipping company Deilmann. Passenger ship Nordsee I, ex. 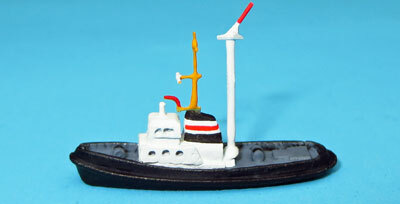 Hein Godenwind (see HY-KÜ-43) under shipping company "Förde-Reederei GmbH". Some weeks ago I presented historical passenger feries for the HY-ART-series. 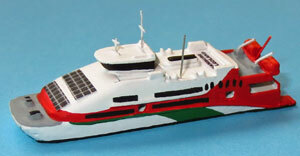 The following new models represent a newer generation of HADAG passenger ferries. 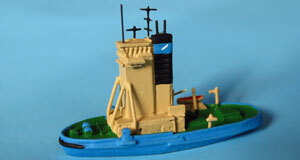 The design of the "Gorch Fock" had been very modern in the sixties. Here without the later blind funnel. 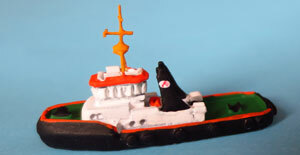 The modern harbour ferry "Max Brauer" in the todays outfit after removing live boats and life rafts. In this way the space for the big sun decks could be created. The model takes advertisements for "GermanyRadio". The "Hein Godenwind" is a beautifully styled passenger ferry. As the Gorch Fock this ship also had been used for the Helgoland- and Hörnum-Service. The HY-ART-production line has been expanded with seven new historical steamers: four offshore steamers (Helgoland service) and three riverboats (Elbe service). "Prinzess Marie" Two years under Albert Ballin coloured in black, later changed to white coating - see also "Germania" (HY-ART-6). "Willkommen" 1899 sold by HAPAG, used 25 years as passenger ferry to Helgoland. 1924 as "Cuxhaven" sold to "Stade Altländer Linie" (see HY-ART-4). "Helgoland" Ship owner was the famous J.C. Godeffroy. Technically ahead of the times its maximum speed was 15 knots. "Groden" The Groden has been sold 1862 by HAPAG. Used as passenger ferry. "Gutenberg" The Gutenberg was still made of wood and owned by Stader DSG. 1842 used as munitions transporter to save Hamburg from the blaze. "Harmonie" HADAG passenger ferry from 1900 - 1927. Used between Hamburg and Finkenwerder. 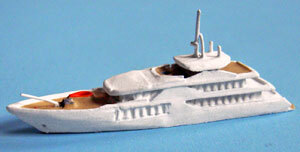 "Delphin IV" The Delphin had been built by Blohm & Voss. Until 1937 used by Wachsmuth & Krogmann between Hamburg and Harburg. 1943 sunken by bombs. 1946 recovered and completely restored (see HY-ART-29). 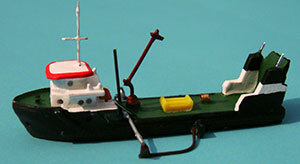 Four more models of anchor handling tugs, because of the big interest in the already delivered. 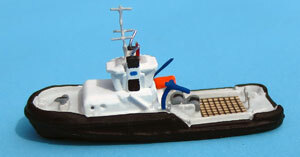 Pegasus is yet another model of the Harms-tug-project. 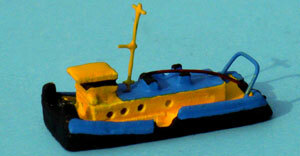 Tempest (in two layouts) und Smitwijs Typhoon are made in Netherlands. 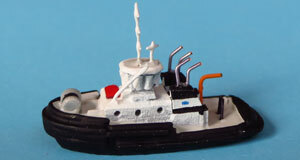 They complete the collection since the german anchor handling tugs had been developed from these. HY-84 "Pegasus" The anchor handling tug Pegasus in offshore mode. 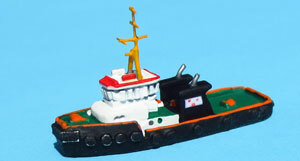 HY-85 "Smitvijs Typhoon" The anchor handling tug Smitvijs Typhoon also in offshore mode. HY-86 "Tempest" The anchor handling tug Tempest in tug mode (ship owner Wijsmuller). HY-86A "Tempest" The anchor handling tug Tempest in offshore mode (ship owner ITC). Today a very common view in the harbour of Hamburg: the yellow container taxi. Here pushed by the tug "Löwe". Both are owned by Carl Robert Eckelmann/Hamburg. Available separately. "Stadt Kiel", ex. 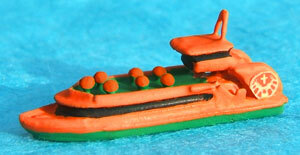 Westerland (HADAG) was a former passenger ferry in Kiel. The ship was used for short trips to Denmark. 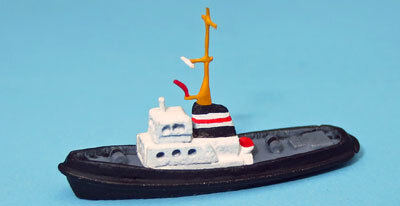 HY-81 "Magnus" The anchor handling tug Magnus in tug mode: decorated with cables and fenders. HY-82 "Taurus" Taurus in offshore mode. On deck lying a special anchor and some other technical equipment. 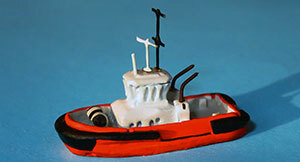 Today I can offer you the new Harms AHTs (anchor handling tugs). 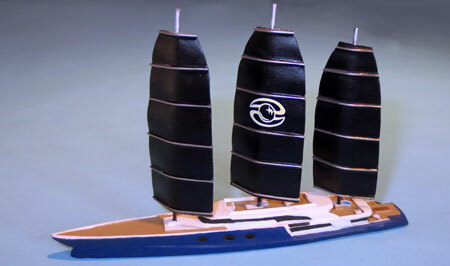 It took some time to produce this ships because of the details made of etching material. 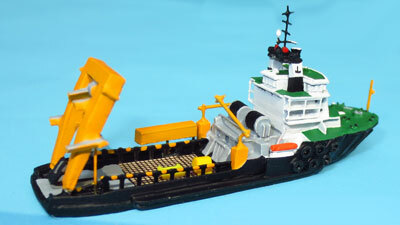 HY-79 "Janus" The anchor handling tug Janus in tug mode. 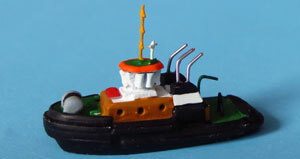 With his 234 t. bollard pull he is one of the most powerful tugs of the world. HY-80 "Ursus" Ursus in offshore mode. On deck lying a special anchor and some other technical equipment. 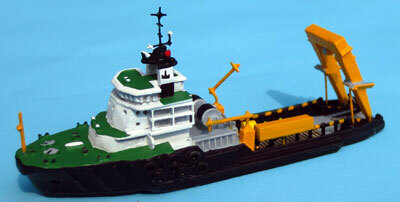 HY-83 "Primus" The anchor handling tug Primus in tug mode. Övelgönne is the last missing Hamburg harbour ferry of type 2000. The design shows "Tag der Legenden", an annual match at the Millerntor football stadium of Hamburg. "Pidder Lyng" This passenger ferry of WDR ("Wyker Dampfschiffreederei") was used for Helgoland service for a long time. ex Stadt Kiel, ex Heimatland, ex Westerland. "Flyingcat 5" After operating in Baltic Sea and Northsea (Helgoland service) this passenger cat now sails under Greek flag. Former: "Hansejet" (see HY-KÜ-16), total new design after marginal conversions. 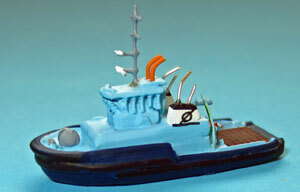 HY-59A "U-Boot 434" The museum submarine U-434 of Hamburg is now available also as fullhull. The waterline model exists already a long time (see HY-59). The U-434 is one of the greatest non-nuclear submarines of the world. Many tourist trips and the Hamburg sight seeing tours stop at the U-434. To meet several demands I have produced a couple of models scale 1 : 400. 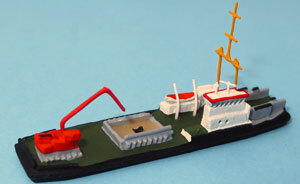 The HADAG type ship 2000, which is by now a well-known detail of Hamburg Harbour, is released today in many different versions. Although I'll continue producing mainly in scale 1:1250 there will be started a new series HY-400 in my production line containing selected models in scale 1:400. As in the past I try to cover also in this partition a whole subject area. The former danish railway ferry "Dronning Ingrid" (DSB) (see HY-6C). had been converted at great expense to the world's largest charity hospital ship. The operator is a christian help organisation. HY-72 "Ex-Dronning Ingrid" after conversion to hospital ship. The ship is currently positioned in Monrovia/Liberia to bring medical care. 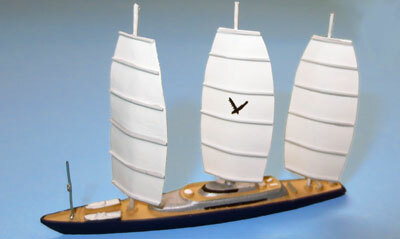 The new models are interesting for both, collectors of airplane models and collectors of ship models. Subject: transport of airbus A380 components with purpose-built ships. Transport is necessary by sea between UK, France, Spain and Germany, by river in UK and in France. the traditional ferry Kirchdorf, which is operating in the harbour of Hamburg. 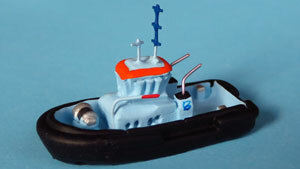 HY-34 "Nyborg" HY-51 "Venus" HY-52 "Gioventu"
HY-3 "Kong Frederik IX" HY-36 "Skane Link"